When we heard the ”The Wicked-ly talented, one and only Adele Nazeem,” (aka Idina Menzel – i.e. Elsa from Frozen, Elphaba from Wicked, Maureen from Rent) was coming to San Francisco with her latest Broadway Show If/Then, we knew we had to take this opportunity to see the star live. 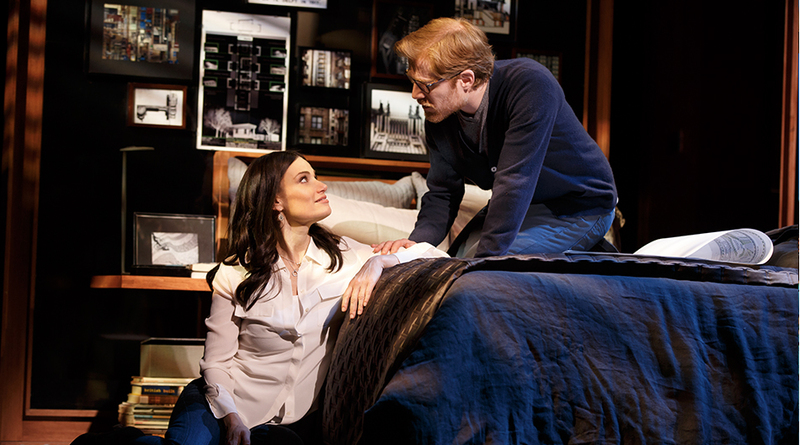 Growing up Rent-heads, we were even more pumped when we learned that her fellow co-star, Anthony Rapp (who originated the role of Mark in Rent), was also part of the star-studded tour. So like the musical fan-girls we are, off we went to the Orpheum to see two of the voices that helped us get through middle school. Brittany: I can’t believe that likely the only time I’ll ever see Idina Menzel and Anthony Rapp live, I didn’t feel like giving a standing ovation. Katie: I know! Idina Menzel was amazing! She’s ridiculously good, but I couldn’t stand for an ovation either. Why are either of them in such a mediocre show?! B: I wonder if it’s an early mid-life crisis thing? If this show really speaks to her as a 44 year old woman who’s feeling “I’ve done all these things with my life, but is this really where I want to be?” It’s hard to believe she’d have regrets though, given she’s one of the most famous women in American theater. Although breaking up with Taye [Diggs] would make me question my life decisions too. I actually like the idea behind the show; the little decisions you make end up changing the course of your life, but the execution was kind of corny. K: Totally corny. The structure of the play just didn’t really hold up for me, bouncing between one possible fate and another. Of course, she’s gonna end up with the love of her life in both story lines. Fate? Really? B: So true. Aside from one or two songs the music isn’t that memorable either. K: All the songs pretty much sounded the same to me. The play sounded like one generic – extremely well sung – song. Other then Idina Menzels beautful voice, nothing really stood out to me. Overall, I was expecting to be more wowed. The Verdict: If you’re a Idina Menzel or Anthony Rapp fan, it is really awesome to see them live. Otherwise, if you’re only going to drop Broadway Tour kinda money once this year, we’d say skip it. The Drama Talk: Idina Menzel is flawless. Anthony Rapp is so fun to watch on stage. Although we didn’t come into the theater knowing her as well, LaChanze was also stellar. The rest of the cast is not nearly as strong as these three, and since the supporting roles are pretty big parts, it made the show feel uneven. The play itself wasn’t a hit for a reason. The music doesn’t make a huge impression, and the show feels a bit disjointed as it jumps from one possible life to another. The Drinks: Since the show was slower than we hoped, we got some sparkling wine at intermission. Skip the main bar in the lobby and head straight to the Blue Room near the entrance to order drinks, that is if you didn’t think ahead to pre-order before the show started. If/Then runs through December 6th at SHN’s Orpheum Theater. There are currently tickets available on Goldstar for $40-60. SHN is also doing a new “mobile lottery”, so if you’re feeling lucky go to the SHN website, download the app, and try to win $25 tickets (you can buy up to two if you win). Otherwise, you can buy tickets directly from SHN which will run you from $40-$200+ depending on the seats. Drama Talk & Drinks: The Phantom of the Opera - "No means no"